Whenever I’m short on inspiration, I like to flick through my little library for ideas. 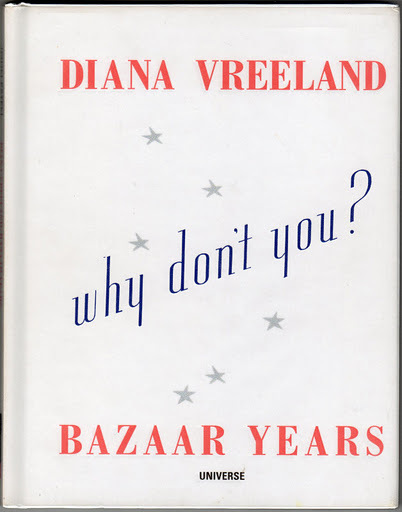 Particularly helpful is this book about Diana Vreeland, fashion editor extraordinaire for many years at Harper’s Bazaar. She was not traditionally beautiful (particularly keeping in mind the blonde, vampy screen sirens of the 1940s-50s which is when her career really took off) but she had style in spades. Her lasting legacy (one of them, anyway) was a column called Why Don’t You…? 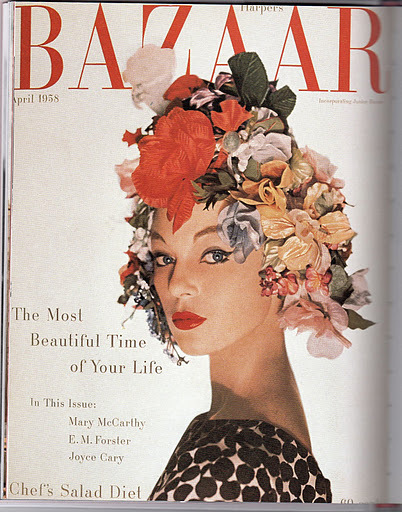 which offered hints for all aspects of life where style is a factor, from interior decorating to accessorising to dressing children. 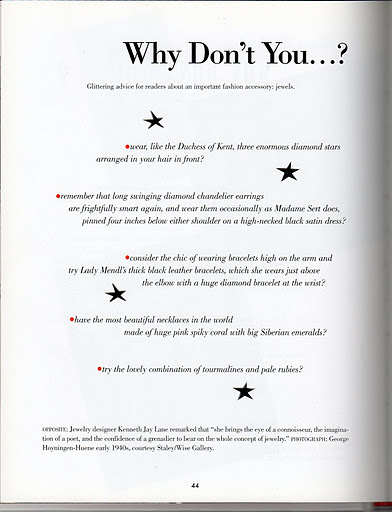 Although some of the suggestions are a bit irrelevant today (such as using a zip on an evening dress – something we take for granted now but was revolutionary in the 1930s) or somewhat impractical unless you’re rolling in money (asking your personal jeweller to use the diamonds you just happen to have lying around to create wearable accessories, using flat Champagne to wash a blonde child’s hair), there is still plenty to inspire. When I started this blog I was thinking of actually following one of the Why Don’t You? tips every few days, similar to the food blogger on which the Julie & Julia film is based, but then I thought it would be too limiting or too hard (contrary to popular belief, there are NO diamonds lying around my house waiting to be reset!). But if anyone out there wants a little blogging challenge, I think this would be a great one! Ha ha me too, it's such a hassle having to clear my desk of diamonds before I start work every day!!! Oh I LOVE DV and her why don't yous… and I think this is a fabulous blog challenge idea! I actually like reading the most elaborate (and unlikely!) ones, if just for a laugh! Does the book have a lot of her tips? I'd love to get that. Yes, there are a lot of tips in it but not all of them. But that just reminded me, I do also have the entire collection of Why Don't You's – but they are probably out in my garage somewhere in among my other stuff that is still unpacked from Tokyo! I'll have to try to find them!